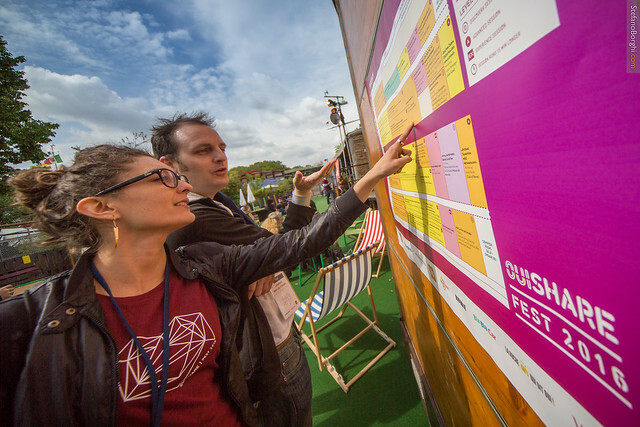 Initially, instead of tracks we wanted to have overarching questions guiding OuiShare Fest 2016. We started with questions generated through Backfeed, from the community, and from the curators. We ended up with about 12 Questions, which we later narrowed down to 6 key questions for the fest. While we ended up straying from the question format, through the brainstorming process we ended up turning the 6 questions into 6 tracks with questions underlying them. This became the basis for the 3 day structure of the fest- each day covered 2 of the major tracks. Additionally, each talk/panel etc. was assigned a level (Discovery, Advanced, Experience), to indicate the level of complexity of the talk.